There is a new type of home canner coming on the scene. While old time canners are used to quaint, imprecise measurements in canning recipes — or perhaps more precisely, have learnt to take them with a grain of salt — the new generation of home canners is having a hard time with them. 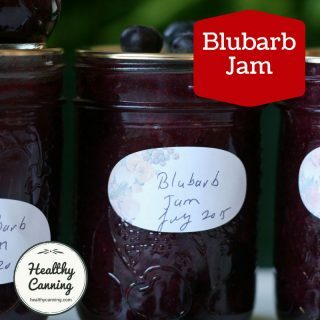 Why aren't home canning authorities overly concerned? What exactly is a small head? How many inches in width and height; how much does it weigh? And the chopped bit — how finely or how coarsely? Even Bernardin, which gives alternative measurements in metric, is often of no more help, giving measurements such as “1 1/2 cups (375 ml) coarsely chopped, pitted dates.”  Bernardin Complete, 2013, Golden Gossip Chutney, page 83. At least they say coarsely chopped, though without a photo you still won’t know exactly what they meant by coarsely chopped (in half? in quarters?) But giving the faux metric equivalent in ml (which should instead be grams for solid items — ml is for liquid) is akin to saying “fluid oz” — do they really want you to liquidize the dates and then pour out 375 ml of that? 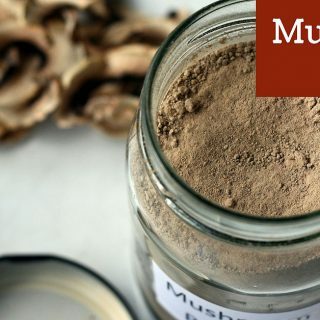 Clearly not, but, a weight would help the recipe user here, particularly as dates are sold by weight so a weight would be a good guide on how many to buy — and particularly as dates have never been the cheapest thing on anyone’s shopping list. Without a weight in both instances, you have actually no way of being precise. 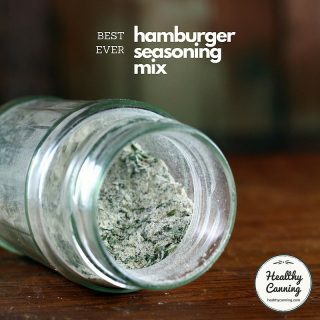 You can’t be, because imprecise terms were used to communicate the ingredients. And yet, the canner is told to be precise or risk extreme danger. It’s easy to see where the anxiety comes in for many. The Putting Food By authors point out how absurd the volume measurements can get at times, even differing between states: “the legal weight of a bushel of vegetables differs among states.”  Hertzberg, Ruth; Greene, Janet; Vaughan, Beatrice (2010-05-25). Putting Food By: Fifth Edition (p. 130). Penguin Publishing Group. Kindle Edition. Her entire approach was about offering cooks a sense that they could do anything, so long as they obeyed the rules and followed her instructions to the letter: absolute obedience would lead to absolute proficiency. 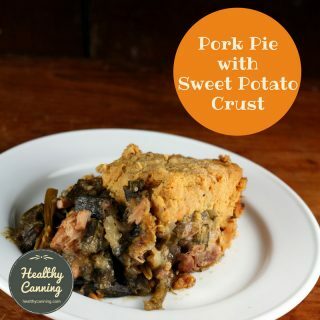 As a latecomer to the kitchen, Farmer had none of the natural instincts to fall back on about how much of any ingredient was needed and how long to cook it. Everything had to be spelled out. She would go so far as to stipulate that the pimento garnish for a certain dish be cut three-fourths of an inch long and half an inch across. The idea was to create recipes that would be absolutely reproducible, even if you knew nothing about cooking: recipes that ‘worked.’ ”  Wilson, Bee. Consider the Fork: A History of How We Cook and Eat. Basic Books. Kindle Edition. 9 October 2012. PP 126-127. Perhaps many frustrated canners would be happier about the call for a given volume of “chopped cabbage” if the call were to specify, as was part of Fannie’s original deal with end-users, precisely what size of chop… ” three-fourths of an inch long and half an inch across.” Mind you, how many of us would be that precise anyway, after about the 20th piece when minds have started to wander. But be that as it may, they don’t. 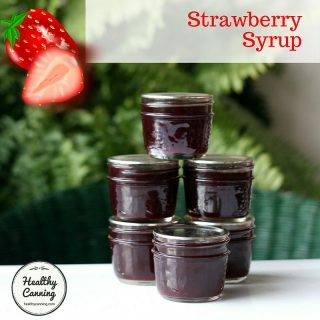 Why aren’t home canning authorities overly concerned? The reason that the authorities don’t address this apparent dichotomy — be absolutely precise with our horrendously imprecise measurements — is because of the secret that is hiding over in the corner of the room in the form of an elephant: all these approved recipes have massively huge margins of errors built into them. This is not to say that you could or should try to push the envelope on those margins of safety. It is just to say, they don’t care if you are under or over “somewhat” on the cabbage or date measurement, because they presume you will be and have already taken that into account. They will still tell you to “be precise”, and they will never verbalize that there is a bit of leeway built into the “1 quart of chopped cabbage” measurement. They feel that if you “give people an inch, they will take a mile”, and make it into 2 quarts, which would likely would be a problem. Again, don’t try to push it and find out where the margin of safety ends — but just relax a bit more about stressing over the exact, “precise to the nearest 1/4 oz” measurements of volume dry things. Do your best but don’t freeze with anxiety about the precise weight of a quart of chopped onion. They aren’t expecting lab precision in a home kitchen: that’s why the safety margins exist. Giving weights as an alternative measurement in brackets really has to start happening for the new crowd of canners coming along. The addition of a weight in brackets would make many people’s lives much easier, if only so they know how much to buy. In the old days in North America, no one had kitchen scales as they were very expensive. Now, they are available for next to nothing, and oftentimes they are cheaper than sets of Pyrex measuring cups. As a result, the new crowd of home canners is far more likely to have a set of kitchen scales, and to be more than happy to have the occasion to use them. Here is another perfect example of why we should be making canning recipes into weights, preferably metric measurements, rather than volume measurements, for accuracy. 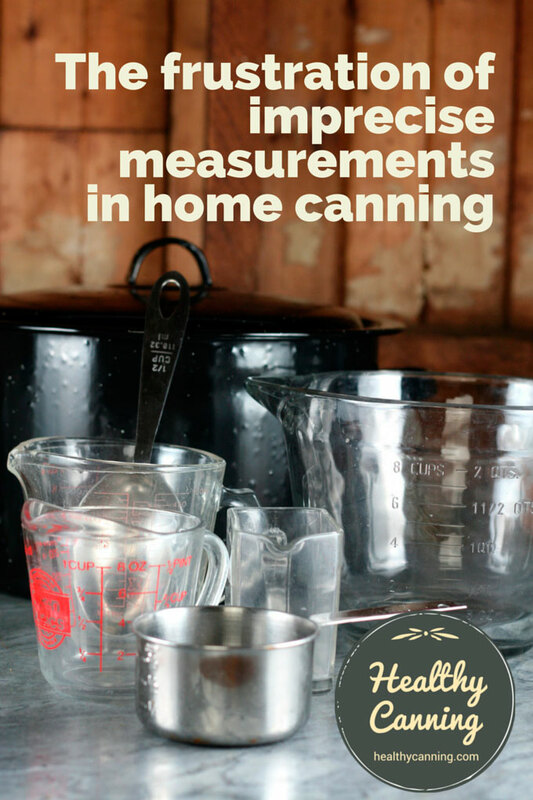 If canning recipes were simply written in weights and home canners bought a $25.00 digital kitchen scale as part of their canning equipment, all of the measurement issues using volume measurements, sizes of fruits and vegetables and personal differences in measuring technique would be removed. Instead of wondering if your tomatoes are medium or small or if the cups were measured before or after chopping the veggies, we could simply measure the weight of each ingredient. What a simple concept.”  “Tracydr” in Garden Web discussion forum. October 2011. Accessed March 2015. 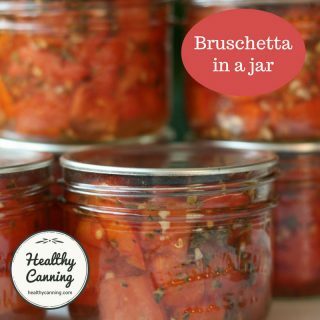 It’s for that reason that all recipes on HealthyCanning.com give both weight and volume measurement alternatives. It also makes your shopping lists that much easier. 1. ↑ Bernardin Complete, 2013, Golden Gossip Chutney, page 83. 2. ↑ Hertzberg, Ruth; Greene, Janet; Vaughan, Beatrice (2010-05-25). Putting Food By: Fifth Edition (p. 130). Penguin Publishing Group. Kindle Edition. 3. ↑ Wilson, Bee. Consider the Fork: A History of How We Cook and Eat. Basic Books. Kindle Edition. 9 October 2012. PP 126-127. 4. ↑ “Tracydr” in Garden Web discussion forum. October 2011. Accessed March 2015. THANK YOU! As a baker who has fallen in love with canning, every fiber of my being revolts against using volume measurements when any kind of precision is required! Different salts have different saltiness by volume. I use weight measures for many dry items like salt, flour, sugar. Even for butter or liquids too. The reason is if you need 1/9th of a cup of vinegar or 10 grams which is easier?